We take idle machinery off your hands. You receive immediate credit for future purchases. 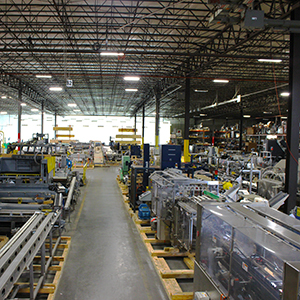 Ready to sell your used packaging and processing equipment? How does Merchandise Credit work? By taking advantage of SIGMA's Merchandise Credit Program, you free up space immediately and receive credit toward any future purchase from SIGMA. Contact our Acquisitions Department and one of our specialists will visit your location to determine the value of your equipment. SIGMA Equipment sends you a Merchandise Credit Agreement for your approval. After you accept the offer, we coordinate with you to arrange shipping. Our rigging specialists will rig and remove the equipment. You promptly receive merchandise credit for your idle equipment. Ready to Sell Your Idle Equipment? Let us know what equipment you have available. We'll take care of the rest.